Pediatric/adolescent spondylolysis and spondylolisthesis: fairly common spinal conditions; may or may not have symptoms. Spondylolysis and spondylolisthesis are fairly common in children and adolescents. These two conditions are interrelated because if left untreated spondylolysis can develop into spondylolisthesis. The word spondylolysis is derived from Greek words that mean spine and break or loosening. It refers to a break at a specific spot in the spine. The bones of the spinal column are called vertebrae. The back (posterior) portion of these bones are connected to one another by a joint (the facet joint). There is thin portion of bone (the pars interarticularis) that connects the two segments of this joint. Basically, the pars interarticularis (or simply pars) is a small piece of bone involved in connecting the vertebrae to one another via a joint. Joints are important because they permit movement. Spondylolysis occurs when the pars fractures. It usually affects the last two bones of the spine (lumbar vertebrae) because this location is vulnerable to repetitive motion injury. Spondylolysis is a common cause of low back pain in adolescent athletes due to the repetitive rotation, flexion, extension and loading of the spine that occurs in many sports. In some cases of untreated spondylolysis, the width of the fracture increases, the vertebra becomes unstable and can begin to shift forward. When one of the bones in the spine slips forward it is referred to as spondylolisthesis. Therefore, when a portion of one of the bones in the spine breaks and the bone (vertebra) remains in its normal location, the condition is called spondylolysis. When there is a fracture and the bone slips forward the condition is called spondylolisthesis. The more the vertebra slips forward the greater the chance of nerves becoming compressed (pinched). Nerve compression can cause significant pain and nerve injury. Causes of Spondylolysis and Spondylolisthesis? Repetitive trauma to the low back can weaken the pars and result in a stress fracture. This is why spondylolysis is much more common in individuals participating in sports that put a great deal of stress on the bones of the lower back and in those who regularly lift heavy loads. Sports like gymnastics, diving, wrestling, weight lifting, and football require repetitive rotation, flexion, extension and loading of the spine. Genetics also plays a role in the development of pars fractures. Some individuals are born with thin vertebrae and are therefore at higher risk for fractures. Although spondylolysis is often thought of as a precursor to spondylolisthesis, there are other causes. Spondylolisthesis may be the result of severe arthritis in the spine, a tumor, previous spine surgery, or a prolonged period of rapid growth. 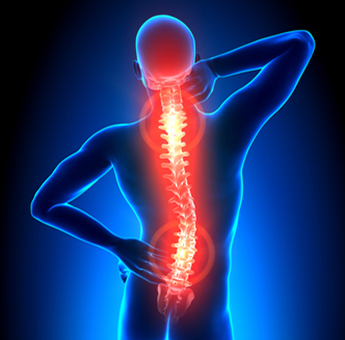 It is estimated that spondylolysis affects between 4-7% of the U.S. population. However only a small percentage of these individuals develop symptoms. Spondylolysis occurs more often in boys than girls. The majority of patients with spondylolysis and spondylolisthesis do not know that they have the condition because they have no obvious symptoms. Symptoms often appear during a teenage growth spurt. With higher grades of spondylolisthesis (i.e., greater slippage) the spinal canal can narrow and nerves may be compressed (pinched). This can lead to pain in the legs and also numbness, tingling, and weakness. This includes an interview with a doctor and a review of the patient's medical records. These are done in order to determine the presence any medical conditions that may be causing the symptoms. Patients suspected of having spondylolysis or spondylolisthesis or that have signs of other underlying medical conditions will need imaging studies. These may include X-rays, a CT scan, an MRI, or a SPECT scan of the low back. X-rays will show the position of the bones and allow the amount of slippage to be determined. CT and MRI scans are able to detect smaller fractures and also determine if other conditions are contributing to the pain. SPECT (Single Photon Emission Computed Tomography) is a highly sensitive bone scan.